Discovered by William Herschel on September 11, 1784. 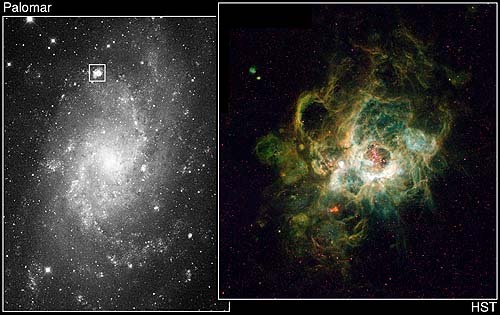 This is a Hubble Space Telescope image (right) of a vast nebula NGC 604 in the Triangulum galaxy M33. At the heart of NGC 604 are over 200 hot stars, much more massive than our Sun (15 to 60 solar masses). They heat the gaseous walls of the nebula making the gas flouresce. Their light also highlights the nebula's three-dimensional shape, like a lantern in a cavern. By studying the physical structure of a giant nebula, astronomers may determine how clusters of massive stars affect the evolution of the interstellar medium of the galaxy. The nebula also yields clues to its star formation history and will improve understanding of the starburst process when a galaxy undergoes a "firestorm" of star formation. 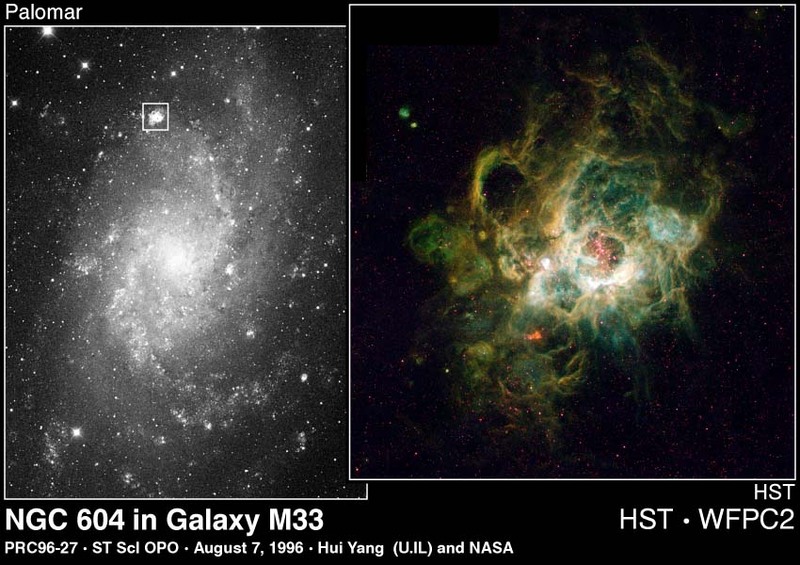 Credits: Hui Yang (University of Illinois), Jeff J. Hester (Arizona State University), and NASA. NGC 604 was first cataloged by William Herschel on September 11, 1784, who assigned it the number H III.150.